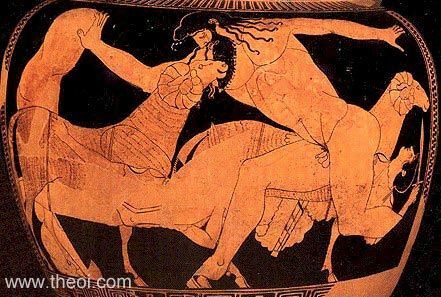 Odysseus and his companion Idmoneus (named on the vase) escape the cave of the Cyclops Polyphemus by hanging to the underside of rams. The blinded giant lifts the rock sealing his cave to release the flock. He is, unusually, depicted with hooves instead of feet.